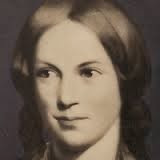 Charlotte Brontë (1816—1855) is the eldest of the three famous Brontë sisters. She had had two older sisters who both died in childhood. Her mother also died when Charlotte was 5-years-old. Her father was an evangelical Anglican priest who was appointed Rector of Haworth in Yorkshire in 1820. Charlotte, Emily and Anne, became their own literary community — assisting each other with their poetry and fiction. Charlotte is best remembered as the author of the novel Jane Eyre (1847). She received two offers of marriage in 1839, another in 1851, and finally in 1854 she married Arthur Bell Nicholls — her father's Curate. Her remaining siblings all died prematurely: her brother Branwell and sister Emily in 1848, and lastly Anne in 1849. Charlotte, herself died in 1855 due to overwhelming sickness during her pregnancy.